For Mr Chizhov, the potential for bureaucratic overload has echoes of another time and place — Soviet Russia. "Brexit means Brexit is a very interesting expression," says the Russian ambassador, referring to Prime Minister Theresa May's mantra on exit. "It reminds me of Leonid Brezhnev saying, 'the economy should be economical'." Since there's a thriving business now in analyzing every interaction of European leaders with Donald Trump, here's another: during her appearance in Bavaria at which she delivered her bleak assessment of the G7 summit, she also drank beer. The British media were apparently too busy with Diane Abbott's hairstyle to notice, since normally any choices of women leaders are subject to massive scrutiny. But anyway, the point is -- Trump doesn't drink. For a would-be alpha male like Trump, she was sending a message. Democracy sells, but who's buying? CARACAS, Venezuela— Goldman Sachs Group Inc. GS 0.48% bought about $2.8 billion in Venezuelan bonds that had been held by the oil-rich country’s central bank, a lifeline to President Nicolás Maduro’s embattled government as it scrambles to raise funds in the midst of widening civil unrest. The New York-based bank’s asset management division last week paid 31 cents on the dollar, or about $865 million, for bonds issued by state oil company Petróleos de Venezuela SA in 2014, which mature in 2022, according to five people familiar with the transaction. The price represents a 31% discount on the trading Venezuelan securities maturing the same year. Note the Goldman Sachs trade strategy: for European democracies in 2008 and after, buying their bonds at knock-down prices associated with massive losses being passed on to taxpayers. But for imploding Venezuelan petro-socialist autocracy, that same knock-down price is better than the zero they should be getting, and keeps them in power. A United Arab Emirates government minister on Sunday warned that an alliance of Gulf Arab states was facing a major crisis and he said there was an urgent need to rebuild trust. Anwar Gargash, UAE Minister of State for Foreign Affairs, made his comments on Twitter less than a week after Saudi Arabia and the UAE signaled frustration at Qatar. Its state media published purported remarks by Qatari Emir Tamim bin Hamad al-Thani criticizing Gulf rhetoric against Iran and suggesting strains between the emir and U.S. President Donald Trump ... Gulf countries have made no official comment on the rift, which emerged after Trump's first visit to Saudi Arabia and his meetings with Arab and Muslim heads of state since he took office. But a war of words had escalated between Qatari media on one side and Saudi and Emirati media on the other. Remember, the Saudi Arabia part of Trump's overseas travels is the segment of the trip that's perceived as a success. But even there, he seems to have left dissension in his wake,by taking ill-thought out positions on disputes within the region. Percy Alleline: The Minister agrees with me that too many secrets are blown around here. Too much failure, too many scandals, too little solid intelligence. Control. We should be fighting communism, not each other. Percy Alleline: Well, we're losing our reputation. Our partners. Control: [scoffs] Your bloody Yanks! Abedi’s father Ramadan, in an interview with the Associated Press before being detained by Libyan security forces, denied his son had ever been to Syria.However, he did say he had visited Libya a month and a half ago, and returned to Manchester only after winning a cheap ticket to perform a pilgrimage to Mecca in Saudi Arabia. It is unclear exactly when he left the country. The home secretary (Amber Rudd) adds that it was "irritating" that details about the investigation were leaked abroad. Some information on the case has flowed from the US. She says she has been "clear with our friends" that leaks should not happen again. UPDATE: Whoever the US intelligence leaker is, they are giving the big scoops to the New York Times. Henry Campbell-Bannerman, Liberal prime minister between 1905 and 1908, and JM Keynes probably provide the most fitting epitaphs to Chamberlain’s career. The former said of him that he used “the foolishness of the fool and the vices of the vicious to overwhelm the sane and wise and sober”. The latter described him as a “fanatical charlatan”. It is a wonder that such a man can continue to have any influence today. If anti-Semitism is the original sin of the mass killer, misogyny is not far behind. Peter Leary, the author of Unapproved Routes, a new book about the border, says: "The interesting thing about the Irish border is that it was never designed to control the movement of people, but of things — cattle, guns. On an island-wide basis, it seemed to make sense to the people who created it, but that is much less the case up close. The closer you get to the border, the more complicated it becomes." Rather than stand up to Trump, the Taoiseach was surprisingly obsequious. He decided to invite Trump to Ireland – and while this has been spun as a given, it was a choice. He didn’t have to – German chancellor Angela Merkel for example didn’t invite him back to Berlin. It’s all the more peculiar given that the Taoiseach will no longer be in situ if and when the visit takes place. The bonhomie and banter displayed between the two men was excruciating – the contrast between Merkel’s formal dignified body language when she met Trump the following day and the back-slapping of the Irish couldn’t have been starker. Ms. Merkel invited Ms. Trump [Ivanka] to Germany to join a panel on women’s entrepreneurship. Ms. Merkel has also learned the value of simply staying in touch. While her meeting at the White House with Mr. Trump included an awkward photo opportunity that suggested coolness, she has kept in regular contact. When she planned to travel to Saudi Arabia last month, she called Mr. Trump first, ostensibly to ask his advice — counsel that after 12 years in office she hardly needed from a diplomatic novice. There are many inexplicable things about the Trump presidency, but among the most -- simply from a self-preservation perspective -- is why Trump was so slow to react to the obvious legal danger he was revealed to be in by the House intelligence committee hearings on March 20, when James Comey told the world -- and him -- that there was an investigation into his campaign's links to Russia. At that point, Trump should have lawyered up and quarantined himself from any further Russia entanglements. Instead, perhaps out of a belief that the whole thing was a creation of liberals and FAKE NEWS, he dug deeper. That's 2 months more of perilous utterances, and 2 months lost time in dealing with anything else. If he can't react to things in plain sight, how will he react to anything that requires perception and nuance? Many fine Soundgarden songs, but one of the best was not on an album: this from the Singles soundtrack, here a live version. In the wake of the violence yesterday outside the Turkish ambassador residence in Washington DC, commentators seem surprised that non-American security personnel could be brazenly operating on the street, in this case the security team of President Erdogan. Anyone surprised should look at the case of Orlando Letelier. UPDATE: There's also a precedent from President Erdogan's visit to the Brookings Institution last year. By negotiating a model free-trade agreement with Britain, the president would boost Mrs. May’s chances of getting a better trade deal for Britain out of the EU. Britain cannot negotiate a trade deal with any non-EU country as a member of the EU. That's not anyone's opinion, it's a simple fact, embedded in its membership. Thus his recommendation only makes sense if he envisions Britain crashing out of the EU without a trade deal, and then negotiating one with the USA before the EU in order to somehow extract a "better deal" with the EU. That's the kind of thinking that exists in influential circles in the USA, perhaps even with the ear of an impulsive President. Has there been a more wrong international politics narrative over the last three years than the claim that Angela Merkel (CDU) is facing imminent electoral doom over whatever is her latest "controversial" policy? 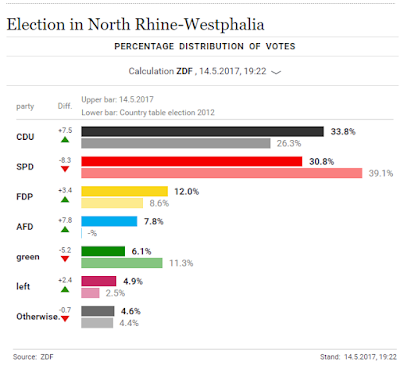 North Rhine-Westphalia election results via FAZ (yes, that newspaper that British journalists can't read). The song is actually from 2008 but its relevance has only increased. It is important for Mr. Barnier to understand that Ireland’s approach to Europe and to international commitments is deeply intertwined with our national identity. Last year, we marked 100 years since the most important founding event of our Republic. The nationalism of the Rising of 1916 and the Proclamation of Independence is a generous one. It defines the Irish nation as having diverse elements and seeks a State which works with others. Our republican Constitution, adopted in 1937 at a dark moment in world affairs, goes even further and explicitly recognises the role of international law and co-operation. We have no nostalgia for a lost empire and no wish to assert superiority over others. We have never sought to stand apart from the world, jealously guarding the right to say no to everything. We fully understand that only when states work together they can secure peace, progress and prosperity for their people. That is why we will remain active and constructive members of the European Union. The paradox inherent in the 1937 constitution is that its architect designed it more as an end than as a beginning: its purpose was not to inaugurate a brave new world but to drop the curtain on the old world of the Irish Free State. Published on 1 May, approved by the Dáil on 14 June, endorsed by referendum on 1 July, it came into effect on 29 December 1937. It affirmed the Irish nation's ‘inalienable, indefeasible, and sovereign right to choose its own form of government, to determine its relations with other nations, and develop its life, political, economic, and cultural, in accordance with its own genius and traditions’ (art. 1) and declared that ‘Ireland is a sovereign, independent, democratic state’ (art. 5) whose head of state would be a president elected by direct popular vote to hold office for seven years (art. 12). Again de Valera shrank from the straitjacket of the republic, preferring to name the state ‘Éire’ (‘Ireland’) rather than ‘Poblacht na hÉireann’ (‘The Republic of Ireland’). This ambiguity, like the external relations act of 1936, wreathed Ireland's relationship with the commonwealth in a haze of uncertainty designed to deter British retribution that might entail the loss of rights of Irish-born citizens in Britain or, even worse, their enforced repatriation and the closure of the safety valve of emigration. When the name of the state was changed to ‘The Republic of Ireland’, moreover, as de Valera explained to the 1937 Fianna Fáil ard fheis, he wanted ‘to see it in operation, not for twenty-six counties alone, but for the whole thirty-two counties’ (Moynihan, 331). He also hoped that even a vestigial commonwealth link might make it easier to end partition in order that, as he naively explained to the British, ‘when Northern Ireland came in, the contact with the crown which they valued so highly should not be entirely severed’ (Fisk, 63). Micheal Martin thus operates in a world (at least for public consumption) where pre-1937 Ireland couldn't engage in its own international relations. That's not true. Ireland signed a full international treaty on trade with Portugal in 1929 and in any event, the Free State had been successfully pushing to the limit the powers that it had in the Anglo-Irish Treaty of 1921 and the evolving powers of all the Dominions. The final irony is that, as Fanning explains, Dev couldn't actually write the Constitution that Martin claims he wrote because he feared that the Free State was too dependent on Britain to withstand a rupture of economic links. That constituency has resurfaced in the antics of the closet West Brexiters. Afflicted with Dev's vagueness on The Irish Question, Martin really needs to say if he thinks, as the West Brexiters do, that Ireland needs to conduct its own Brexit negotiations with the UK. 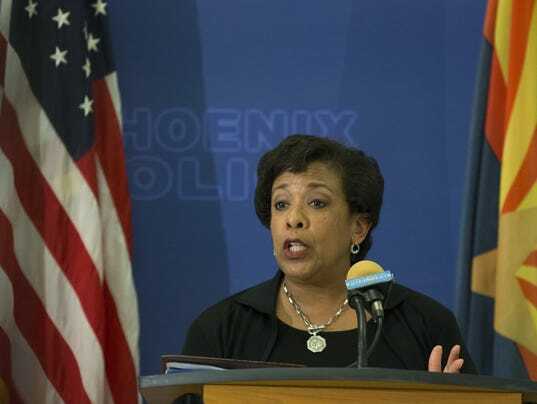 In the photo (by Mark Henle from the Arizona Republic), Obama-era Attorney General Loretta Lynch gives a speech on community policing in Phoenix, 28 June 2016. So now you ask: how can this possibly be the photo of the day, for any day? Because at the airport after giving that speech, she had a chance meeting with Bill Clinton, and that set off a cascading series of events, the latest of which is James Comey's sacking yesterday (Comey initially inserted himself into the Hillary Clinton e-mail investigation because he believed that Lynch couldn't appear impartial after that meeting). Brexit supporter "had inconsistent opinions"
The feeling that Pink Floyd had already lost their relevance by the end of the 1970s is dealt with crisply and summarily, with a replica of Johnny Rotten’s infamous “I Hate Pink Floyd” T-shirt. A notice informing us that Rotten subsequently confessed to loving the group seems a little po-faced; whatever the charms of punk were, intellectual consistency was not among them. If Mrs May irradiated all currency and gold reserves rather than hand over a pound to the EU, some genius would say how well it played with the crucial retired East Anglian home-owner demographic. This is the political class at its most inane. The problem is not the prime minister's failure to rise from electoral tactics to the national interest, but ours. The Irish addendum to this is a noisy group of eejits centred on the Sunday Business Post opinion pages would claim that the latest act of May madness is further proof that Ireland cannot trust the EU and must negotiate directly with the Tory government. Beside the fact that Donald Trump choosing Saudi Arabia for his first foreign visit is revealing in its own right, there are various signals (e.g. the remarks of the Saudi foreign minister in Washington DC when the visit was announced) that the visit will lead to another run at the "Arab Peace Initiative" as a potential solution to the Israel-Palestine issue. This initiative certainly makes for "sounds reasonable" reading, but the origins of this initiative need to be remembered: it emerged in 2002, 6 months after 9/11, with eyes in the White House already looking at Iraq, and needing something that could realign Arab opinion given the centrality of the Palestinian issue up to that point. And then some strange things happened. Tom "Air Miles" Friedman wrote one of his fantasy memo columns, published 6 February 2002, a letter from George W. Bush to Saudi Crown Prince Abdullah, King Abdullah of Jordan, Bashar al-Assad, and Hosni Mubarak, and the rest of the Arab League. That list of addressees tells you something. Anyway, Friedman's fantasy memo proposed that Israel would withdraw to its pre-1967 lines in exchange for full recognition by the Arab world. There was some murkiness about what would happen to the displaced Palestinians, but that was glossed over. Friedman then published a more famous column 2 weeks later, from Riyadh, where Crown Prince Abdullah (RIP) flattered his visitor by implying he was so clairvoyant about Saudi thinking that he must have broken into his desk -- because Abdullah was about to propose exactly what Friedman wanted at the Arab League summit in Beirut the following month. That proposal became the "Arab Peace Initiative" and the basic outlines have remained the same over the following 15 years. Yet its provenance does merit some scepticism about its viability. From the appearances of the time, it was an idea that went from a New York Times opinion column into a proposal of monarchs and dictators while suiting the interests of the Saddam-obsessed White House. Donald Trump is not one for subtlety and nuance, but someone maybe should tell him where the peace deal that he's about to champion came from. On Macronleaks: normally we'd embed this tweet (via Le Monde) but that would be needless additional visibility for its denizens: a photo at a "Cinco de Milo" event featuring key propagator of the Macron campaign e-mail dump, Trumpist Jack Posobiec, with Milo Yiannopoulos (yes, that Milo) and an operative in the charming SlavRight movement, the bridge between Putinism and the western hard right. We noted a few days ago the obsession with the sight of Angela Merkel's hair during her visit to Saudi Arabia -- an obsession, that is, for the Anglophone conservative media (Telegraph, Mail, Fox News). Now there is a new twist. A highly predictable coalition of Russian twits, Islamophobes, and general purpose Arab haters is circulating an obviously photoshopped picture of Mrs Merkel's hair allegedly pixelated during Saudi TV coverage of her meeting with the King. Since there were widely available pictures of the meetings circulated by official Saudi news agencies and TV, it takes around 5 seconds of effort to establish that it's fake. Saudi Arabia of course has serious social problems. But for unclear reasons, it goes through spells as the Twitter troll army's Outrage Du Jour, facts be damned. The Wall Street Journal online editorial page for Thursday. 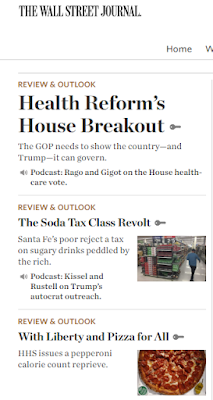 Three editorials stacked on top of each other. The first advocates for the US House Republican healthcare bill which makes it easier to exclude people with pre-existing conditions from the health insurance market. The second celebrates the demise of a proposed tax on sugary fizzy drinks in Santa Fe. The third celebrates the demise of a federal requirement that chain restaurants publish calorie counts on menus. It's almost as if conservatives want working class people to be overweight, pre-diabetic, and not contaminating the debate about healthcare! This debate is also distorted by a misunderstanding of health risks. The actuarial probability that a healthy person will become sick is already priced into premiums, meaning it is true insurance for unknown future health outcomes. People with pre-existing conditions don’t need insurance—they need help paying for expensive treatment that is already known. High-risk pools are a fairer and more equitable solution to this social problem, rather than hiding the cost by forcing other people to pay premiums that are artificially higher than the value of the product. The WSJ perspective, which is widely shared by Congressional Republicans, is that healthcare is easily manageable problem that pesky liberals complicate. In fact, in sweeping aside concerns about adverse selection, moral hazard, and the constant flows of people through various health categories through more or less predictable events, they're the ones engaged in the Hayekian delusion about the simplicity with which this market can operate. The FAZ story from Saturday that only arrived by pigeon post today. Is Gisela Stuart not answering the phone? Does someone have a full English translation of the FAZ piece on the Downing Street dinner? This is the same Tim Shipman (now political editor of the Sunday Times) whose Telegraph story on the 2008 Obama transition was so, er, imaginative that the internal Obama team reaction was "Not even sure how to react to this article, since there's almost nothing in here that's accurate." UPDATE: Frankfurter Allgemeine Zeitung has taken pity on the Anglophone media and posted the entire story online. The hacks will still need to know how to use Google Translate. 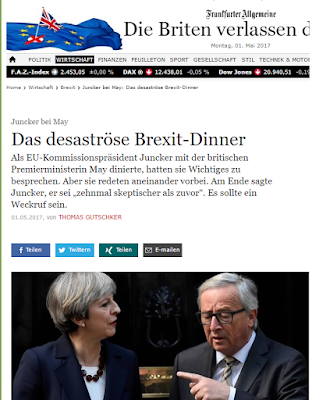 It is likely that the blinkered British media do not see the irony in being flummoxed by the FAZ story about the Juncker May dinner, having reveled in the dubiously sourced and tendentiously interpreted version of the Merkel Trump meeting just a few weeks ago. Then, she shook hands with Prince Saud bin Abdulmohsen bin Abdulaziz, Special Advisor to the Custodian of the Two Holy Mosques; Prince Khalid bin Bandar bin Abdulaziz, Advisor to the Custodian of the Two Holy Mosques; Prince Dr. Mansour bin Miteb bin Abdulaziz, Minister of State, Cabinet s Member and Advisor to the Custodian of the Two Holy Mosques; Prince Miteb bin Abdullah bin Abdulaziz, Minister of National Guard; ministers and senior officials. The King shook hands with members of the official delegation accompanying the German Chancellor. UPDATE: While the German media were busy covering Brexit, the sartorial freakout about Merkel's visit is in ... the Telegraph and Fox News!